Of all the breakthrough tales of life on the streets of London, perhaps one of the more unlikely ones was that of James Bowen and his cat Bob. 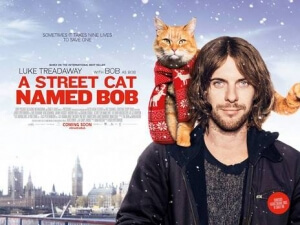 Their partnership became an instant hit with passers-by and soon that of the rest of the nation, with a bestselling series of books written by Bowen based on his own experiences, and now a feature film based on these books, taking its title from the first book A Street Cat Named Bob. But is the heart-warming true story represented well enough on the big screen for more people to become interested in its humbling themes of homelessness and addiction? That’s for me to write, and for you to read… starting now. The film tells us the humble origins of this unlikely partnership, and specifically of their unfortunate early circumstances. We first meet Bowen (played by Luke Treadaway) when he was a homeless drug addict, busking in Covent Garden for change from members of the public, and failing to impress his rehabilitation sponsor (Joanne Froggatt) with his inconsistent behaviour. Things change when he is given a residence in a rundown flat, and one night comes across a stray ginger cat that has snuck in through the window. The two soon become inseparable, with the cat – now named Bob – proving to be a hospitable influence with helping Bowen to overcome his addiction, reconnect with his estranged father (Anthony Head), and be a better person than he was before he crossed paths with his new feline friend. Cat lovers will undoubtedly eat this up, and as more of a cat person myself I can definitely see the appeal. Bob the cat is played by the real-life Bob the cat for a majority of the film, and he has an adorable feline that seems very well trained and even quite the professional actor in certain scenes. Director Roger Spottiswoode has, across his long and extended film career, worked with all types of animals – most notably the Tom Hanks and dog team-up Turner & Hooch – and here brings Bob’s on-screen charm to life as efficiently as he did previously, even incorporating several shots from the cat’s point-of-view, which at first comes across as rather gimmicky, but becomes more natural as the film goes on. If you are into cats yourself – though perhaps on a more severe level than I am – then this is absolutely your type of catnip. As for the rest of the film, it’s honestly just okay. Nothing more, nothing less, it’s just okay. The way that the film is structured is very much like a standard tale of atonement and rehabilitation that a lot of films about recovering drug addicts tend to be, and it hits a lot of very familiar notes that more often than not remind you that you are just watching a film in a cinema rather than experiencing a truly harrowing real-life tale. You have the moment(s) where everything has gone to pot, including a late-second-act “liar revealed” situation, and predictable scenes of mayhem and misunderstandings designed to add more drama for drama’s sake, and they just come across as being rather forced. It’s understandable, since when you take away the more dramatic moments it’s a very lightweight narrative, but even so it doesn’t excuse the familiarity of this script and how it rubs off onto the (human) performers, who honestly do fine with what they’ve been given. There were a few characters I had problems with – particularly a love interest played by Ruta Gedmintas, who I honestly found to be rather unlikeable with her pretentious habits and irritating free-spiritedness, she was more of a nuisance than actually endearing – but not enough for me to really ruin this movie for me. Mostly, it was just a case of a very familiar script being worked around a story which probably could have been portrayed just a little better, if only for the sake of raising more awareness for its good-natured causes. Topics such as homelessness, drug addiction and even social standards regarding working class citizens or people just looking for alternate means of finding an income – at one point, Bowen and Bob end up working for The Big Issue, an outlet that specifically benefits those types of people – are brought up, but aren’t fully examined because it’s more interested in a very sub-standard rehabilitation story that we’ve seen many times before. I wouldn’t say that A Street Cat Named Bob is a complete failure, but it’s probably just best to have on in the background while you tend to your cats. A Street Cat Named Bob is merely an okay representation of a heart-warming true story, relying on way too many familiar plot beats and problematic characters to fully work, and is probably best watched surrounded by your own feline friend.